If you love being spoiled by nature and being ‘lost’ in the middle of nowhere with a superb view, you gotta love Padar Island. This small island in Komodo National Park, Flores, Indonesia, is gaining popularity due to its wonderful scenery. The view from Padar’s top peak is one of the most beautiful sight in Indonesia. It’s also home to the unique three colored beaches as well as the world famous Pink Beach. Beneath the jurassic-looking island, Padar hides a very interesting underwater landscape. Rather than a complementary destination, Padar is worth for a day trip! if you wish to make full of what Padar has to offer. The gate is open to explore every nook and cranny of Padar Island, which will keep you busy for hours! 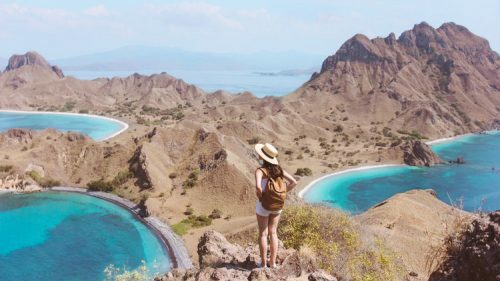 Padar Island is just synonymous with trekking. The island is famous for its hilltop pic outlook, and that’s often serve as the main reason to visit. And to reach the hilltop, you need to hike. Well, actually, due to the tumultuous topography of the island, you practically need to hike everywhere you go. The best hiking time to Padar hilltop is an hour before the dawn or sunset. It gets especially hot during the midday, when the sun is right on top of our head. Trekking during these time gives you protection from the direct sun—and also a very rewarding view! The trek is easy and short, despite of the steep paths. It takes about 30 to 45 minutes to reach the peak from the shore. It’s quite sandy and rocky as well, so make sure you wear a pair of good sporty shoes! It’s time for sunrise watching! Seriously, waking up in Padar Island is simply the best thing in the world. Reach the top and find a good spot to enjoy the nature show. As soon as the sun is peeking from the horizon, the darkness is slowly lifted and the landscape start to change colors. The three beaches is gleaming, catching the first light of the morning. Just off the shimmering shore, the vast ocean gradually shows its blueness—deep and calming. Above, the sky displays an ever-changing colors—a warm transition from purple, orange, to pink and blue. And when the sun has actually risen, your breathe will be taken by exotic curve of the whole Padar. All the rolling hills, the crescent-shaped beaches, and the endless ocean is conspiring to take your breathe away. This will be one of the best sunrise on your life. Now when the island is totally awake, take time to stroll around the tumultuous terrain. There is many spots in Padar Island which gives a perfect setting for photography. Venture to a spot where not many people goes to. Search for a different spot that will bring a different perspective of the Island. I heard some other traveler found their own hidden pinnacle to gave better view of the three beaches. One even found a spot where the Pink Beach look the pinkest. So, go and find your own best spot! 09.00 – Pink Beach Chill! It’s time to chill in the last slice of Paradise. To bathe in the sun where the soft pinkish sands meet the clear blue-green ocean. After all the hike and handwork, what’s best than a chill in this dreamy beach? Spread your picnic blanket, it’s time to have lunch in the middle of cotton candy land. Remember to not take the blushing sands back home, though. Let future travelers enjoy the same Pink Beach as you do right now. As part of the protected Komodo National Park and the Coral Triangle, the underwater of Padar is blooming with marine life. Here you can see the red corals, the culprit behind the glowing pink sands. Just few meters off the shore, the sea bed is alive with healthy preserved corals and thousands of fishes. It’s even more perfect with great visibility and crazily clear water! You cannot enter Padar Island without entering the Komodoo National Park. And now, it’s time to see the dragons. Padar sits right in the middle of Komodo Island and Rinca, where the Komodo dragon dwell and creep around. It only take an hour by boat to reach one of those two islands. Prepare yourself, it’s time for another thrilling adventure.